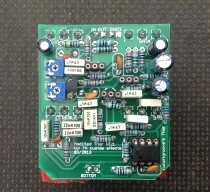 This is my PCB for runoffgroove’s Umble overdrive. The circuit has been altered to have less gain. The original had way too much for my liking. Listen to the soundfiles! Here is the link to ROGs project and their soundfiles…. This is my PCB for runoffgroove’s Professor Tweed overdrive. Here is the link to ROGs project and their soundfiles. The Professor Tweed is a Fender-princeton-like overdrive. Board mounted pots can be used to make the build easier.